Saint Mark's in 1876, sans Rood Beam. Saint Mark's Church had its beginnings in the aspirations of a group of relatively young, forward-looking Philadelphians who, in 1847, met at the house of George Zantzinger, located on the corner of 16th and Locust, in what was then the western suburbs of the city. Zantzinger and his friends were members of various Anglican parishes, all situated east of Broad Street in the busy commercial heart of the city. But on June 28, 1847, these Anglicans were intent upon founding a new sort of church, one which was organized upon the spiritual principles of what is called the Oxford Movement. Members of this group were building the Church of St. James the Less near East Falls as a country church at that same. In addition to advocating a return to historical customs in liturgy, ceremonial, and pastoral care, the Oxford Movement favored a church architecture based upon that of the distinctly Christian buildings of the high Gothic period (ca. 1350-1450). In that light, members of the first vestry of Saint Mark's raised $30,000, consulted with the British Ecclesiological Society, and hired the Scottish Philadelphia architect John Notman to construct a town church partially based upon medieval plans. Two years later, on October 21, 1849, parishioners first walked down the aisles of the nave, under the overarching timber fretwork of the great roof, and celebrated Saint Mark's first service. The unfinished spire was completed in 1851 making Saint Mark's the tallest building west of Broad Street. Joseph Wilmer, first rector of Saint Mark's. Services at Saint Mark's have from the first been those of the Anglican Book of Common Prayer, long recognized as one of the glories of English prose. No doubt this would have been the fast opinion of Henry Reed, the man who presided over that first organizational meeting in 1847. Reed, a professor of literature at the University of Pennsylvania, was widely recognized as the most prominent man-of-letters in Philadelphia, one who was at the forefront of the literary movements of the day. Today, Reed would probably be considered learned, sophisticated--most certainly a "modern" thinker. A personal friend of William Wordsworth, Reed had written in 1841 to the British poet asking if he would include in his series of ecclesiastic sonnets a poem reflecting upon "the transmission of the spiritual functions of the Church of England to the daughter church in this Western Continent." Wordsworth responded with a poem that described a church such as Saint Mark's "As one who drew from out faith's holiest Urn/ The purest stream of patient Energy." Unfortunately Reed did not live to experience the full power of the energy and accomplishment of the members of the first vestry. In 1854, returning across the Atlantic from a visit to Mrs. Wordsworth, his ship collided with another, and along with 200 others Reed was lost at sea. Today, those sitting toward the front of the nave can look to the south and see one of Saint Mark's most notable stained glass windows, a double paneled image of Christ and St. Peter on the Sea of Galilee, which was installed 19 years after Reed's untimely death as a memorial to this visionary founder. Over the next few years Saint Mark's had two rectors, each of whom served relatively short terms: E.A. Washburn and Walter Mitchel. But it was Eugene Hoffman, a dynamic High Church ritualist, who had the most immediate influence upon the future physical, spiritual and mission-outreach growth of the Parish. 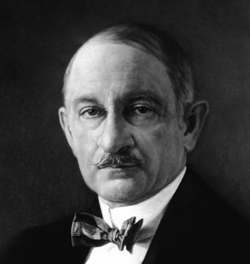 Eugene Hoffman, one of Saint Mark's more influential rectors. By the end of the first decade and a half of Saint Mark's existence, a Parochial School had been built on the western end of the church property, a caenstone altar and reredos installed in the chancel, a surpliced choir formed, a Parish Employment Society founded to "to provide (in part) for the wants of the poor," a Workingman's Club and Institute created at 16th and Bainbridge, and an Altar Society was organized to care for all items in the chancel. At the same time, the Saint Mark's neighborhood, once mostly empty land, was being rapidly built up. Where in the 1840's only one house stood, now some of Philadelphia's most famous architects were constructing a great row of townhouses across the street from the church. Indeed in the few years following the Civil War, what is now known as the Rittenhouse Square neighborhood was created, seemingly overnight. One of Saint Mark's most famous parishioners of the day, General George Meade, the victor at the Battle of Gettysburg, took up postwar residence just a few blocks away from the Square. When Meade died unexpectedly in 1872, he was memorialized by Hoffman, who reminisced about celebrating Easter with Meade in the General's wartime camp. "It was a strange place for Easter flowers and Easter songs, and the story of the Resurrection," Hoffman remembered, "but I do not recall a sweeter service or one more redolent of the peace of heaven." After his funeral, Meade's coffin was solemnly borne from the church to its final resting place by friends and old colleagues, among whom was the then President of the United States, Ulysses S. Grant. In the decades following the Civil War, Saint Mark's continued to strive to expand its ability to meet the spiritual needs of central Philadelphia. On Advent Sunday, 1869, the celebration of the Eucharist twice every Sunday and on Prayer Book holy days was initiated, a tradition that continues to this day. 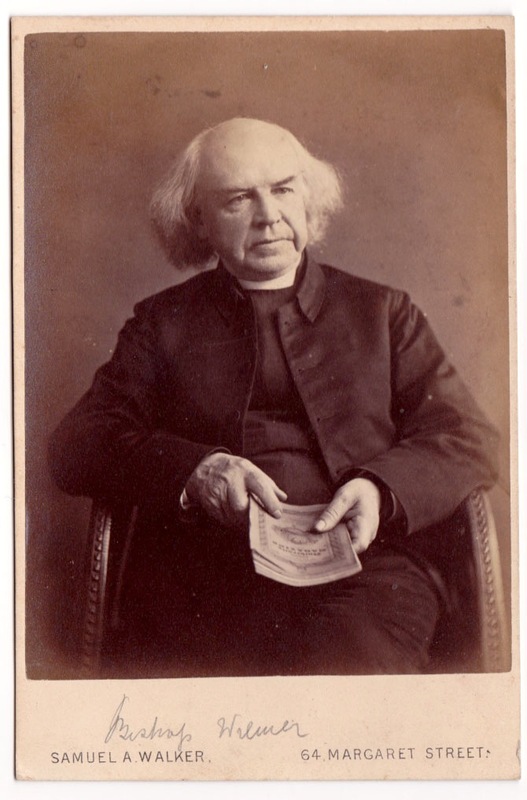 After Hoffman's resignation in 1879 to become Dean of the General Theological Seminary in New York, the fifth Rector, Isaac Nicholson, stepped in to carry on Saint Mark's effort to fulfill its sacramental and educational missions. In 1884, the present Baptismal Font, which today sits just to the left of the tower door entrance, was installed. That same year, the daily offices were established. Again, this opportunity for Morning and Evening prayer continues today. At the same time, it became obvious to Nicholson and others that the Saint Mark's neighborhood was changing even more radically than it had in the early days of the Parish. No longer, as Nicholson told the people of Saint Mark's, was the area primarily residential. Homes began to be replaced by hotels and businesses, with an obvious effect upon the church. Take, for instance, the Parish School, the enrollment of which, after many thriving years, was now starting to precipitously decline. The residential march westward out of the neighborhood had begun in earnest and it would not be too long, Nicholson wrote in his annual report to the Parish, before Saint Mark's would be identified as one of Philadelphia's "down-town" churches. Saint Mark's sixth rector, Alfred Mortimer. Beautifully designed and decorated vestments had long been a Parish tradition at Saint Mark's. Some items of this remarkable collection, created to beautify the Mass, are still in service today. The Altar Society, however, had been formed not only "to care for the altar furniture, vestments, and everything pertaining to the chancel, but also to assist other churches as far as possible in making suitable provision for worship." So expert was the early work of the Altar Guild that creations of the Saint Mark's embroidery committee were to be found in almost every Diocese in America. The custom of gathering and maintaining beautiful ecclesiastical objects shifted into high gear after the arrival of Saint Mark's sixth Rector, Alfred Mortimer. During this period of what some have jokingly called "Mortimer mania," Saint Mark's was transformed from a relatively spare, Neo-Gothic building into one of high ecclesiastical beauty, as witness pieces such as the remarkable 1592 stained glass panel donated by Dr. Francis Lewis, which was placed in the westernmost bay of the south aisle. At the same time, the people of Saint Mark's did not ignore the pressing theological issues of the day. In 1892, the first issue of "The Saint Mark's Messenger" appeared under the editorship of George Wharton Pepper. One of Philadelphia's foremost attorneys, Pepper, who later was appointed to the U.S. Senate, had been preceded as the Rector's Warden by his uncle, Dr. William Pepper Jr., Provost of the University of Pennsylvania. So well respected was "Saint Mark's Messenger" that articles such as "The Church Ritual" were often reprinted throughout the country. In 1899, Saint Mark's marked its fiftieth anniversary. In a short fifty years, the Parish had grown from a few members worshiping in a partially completed building to a large, very active congregation now able to take advantage of one of the most beautiful Neo-Gothic, Oxford Movement churches in America. Just a few short years earlier, on Christmas, 1896, a solemn Eucharist with fully vested Deacon and Sub-Deacon, was first celebrated. Thus, most fittingly, the fiftieth anniversary was marked by a Solemn Requiem on All Souls' Day for departed members of the Parish, the ordinary of this mass being Mozart's Requiem. Despite Mortimer's hugely successful effort to beautify the church proper, those attending Saint Mark's today will notice at the Southeastern end of the nave an arched doorway that leads to an ecclesiastical treasure that Mortimer himself certainly could not have anticipated. In the Spring of 1900, Fernanda Wanamaker, the wife of Rodman Wanamaker, unexpectedly died. Fernanda had attended Saint Mark's and had been an active member of the Altar Guild, among other ministries. To memorialize his wife, Wanamaker donated the money necessary to construct and adorn the present Lady Chapel at the eastern end of the church's south aisle. Built in the Late Decorated Gothic style, with a stone- groined vault, the Lady Chapel was a rarity of ecclesiastical architecture and furnishing. The altar of the Lady Chapel, designed by the celebrated C.E. Kempe, was made of light green and white English alabaster. The triptych displayed black oak figures carved at Oberammergau, Germany, richly gilded and colored after the German style of the Fifteenth Century. In niches on either side of the altar and above the triptych were figures of St. Mary and St. Mark, also richly colored. In the spring of the arch of the sanctuary was a rood beam of oak, gilded and colored, the cross blossoming into roses, after the design in St. Lawrence's, Nuremberg. Fernanda Wannamaker, for whom the Lady Chapel is named. Although today those attending noon Masses at Saint Mark's are able to appreciate quiet beauty in the Lady Chapel, it is not hard to imagine the grandeur of its consecration on February 10, 1902, when the previous Rector, now Bishop Nicholson of Milwaukee, embodied the Saint Mark's history by standing in for the Bishop of the Diocese of Pennsylvania. So liberal was Wanamaker's generosity that, within just a few years after its consecration, he had donated so much that the Lady Chapel became overcrowded. Many of the original objects, such as the alabaster altar and the polychrome reredos, were moved to the north aisle of the nave and dedicated to the honor of St. John, the Beloved Disciple. At the same time, a new Lady Chapel altar and its fittings, created by Carl Krall of London, were installed. This beautiful and ornate altar, which is still used at Daily Mass, is without doubt the most renowned of Saint Mark's ecclesiastical treasures, one that has drawn the interested and appreciative from all over the world. In 1912, after 21 years of service at Saint Mark's, Mortimer retired and returned to his native England. During the interim, the parish was served by priests from The Order of the Holy Cross. The next rector was the Reverend Elliot White, who, in many ways, summed up the history of the Parish when he told the congregation: "God has given us many advantages: wealth, influence, Catholic traditions and ceremonial. To whom much is given, of him much shall be required. We are stewards rather than owners of these good things. The grace we receive from the sacraments, the inspiration we catch from our beautiful services are spiritual forces which God would have us pass on to others in missionary endeavor and social service." During this era, Saint Mark's two very active neighborhood missions, St. Michael's and St. Mary's, also continued to thrive, providing a full complement of services to those residing south of the immediate Saint Mark's neighborhood. But as World War I approached, the Parish was challenged by a number of new problems, local, national and international. Shortly before the war, Saint Mark's parochial School was closed. Though later parishioners criticized this decision, at the time the vestry thought that, due to changes in the neighborhood, "its usefulness was considered to be on the wane." The World War itself also greatly affected the Parish. In 1916, the Easter offering was donated to the Belgian Children's Relief Fund to support the 450 children of Hombeeck for six months. During Lent, 1917, due to a fuel shortage, the congregations of the Church of the Holy Trinity and St. James worshiped during the week at Saint Mark's. But most difficult for the Parish was the loss of a number of its members on the battlefields of Europe, one of whom, Captain Fritz Avery Jones, a former choirmaster, is memorialized by a plaque now hanging in the cloister. During these troubled times, Father White was able to speak to the Parish from the magnificent present pulpit, which was erected in 1913 in the memory of George M. Conarroe, who had been a member of the vestry for twenty years. This magnificent, highly decorated structure, along with the chancel rail and gates, was the work of the famous church architect Ralph Adams Cram, who is probably best known for designing the nave of the Cathedral of St. John the Divine in New York City. The central figure on this marble pulpit is Saint Paul, the great missionary of Christianity and interpreter of the Gospel, and is flanked on the right by Saint Chrysostom, and on the left by Saint Francis of Assisi. Climbing the the stairs to the top of the pulpit to deliver the sermon, the preacher passes and touches four carved figures on the rail, symbolizing the Beasts of the Evangelists. On the right side of the chancel entrance is the eagle-shaped lectern, from which lay lectors read the Lessons. During World War I, the need for intercessions became so pronounced that a League of Intercessions was formed, one which grew to list over 10,000 prayers for the living and the dead. 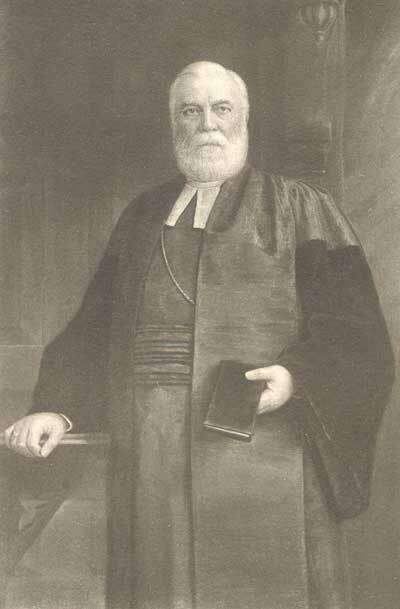 Frank Lawrence Vernon, rector of Saint Mark's for 20 years. The Mass, celebrated in the east end of the chancel, stands as the culmination of all services at Saint Mark's. When first constructed, the chancel of Saint Mark's was a relatively spare space, containing simply a stone altar with a red velvet frontal. But by the 1920's, when the Reverend Frank Lawrence Vernon began his twenty-four year rectorship, the chancel looked much as it does today. A beautiful dark oak rood beam, the central figures of which are Our Lord on the cross, with his Mother on the left, and St. John on the right, was erected in memory of former rector Bishop Nicholson. Behind the rood beam are the canopied choir stalls. On the left hand side, directly above the left hand set of stalls hangs the organ loft. A massive tabernacle for the high altar had been donated, as had the seven silver lamps, modeled after those at the Church of the Holy Sepulchre in Jerusalem, which continue today to hang in front of the altar. It was thus natural for those organizing the 1933 Centenary Celebration of the Oxford Movement to choose Saint Mark's as the site for its opening service, the Solemn High Mass of the Blessed Sacrament, which was celebrated on Monday, October 23rd. This event almost perfectly symbolized the place of Saint Mark's Parish in the world of Anglo-Catholic worship in America. One hundred years after the first heady days of the Oxford Movement and slightly less than 90 years after the Parish was founded, Saint Mark's held a high place, as it does today, in the Anglo-Catholic tradition of the American Church. As Father Vernon said in an annual Report, in effect describing the mission of Saint Mark's: "The Sacramental and prayer life is the source of the power which enables and directs our work for God. So long as we continue our witness to the Faith once delivered to Saints, so long as we are the faithful stewards and ministers of the mysteries of Christ, so long as the parish church remains a house of prayer, so long will faithful Christians find Saint Mark's none other than the House of God, and the Gate of Heaven." But the years of World War II, with many of Saint Mark's young men entering the Armed Services, were difficult ones for Father Vernon, who was then advancing in age. With almost no clerical staff, the Rector continued to work diligently for the people of the Parish, but as one writer recalled "the inevitable happened, collapsed from overwork after the Sung Eucharist on Thanksgiving Day. On May 24, 1944, Father Vernon died, and his Requiem Mass was sung at the High Altar, where he himself had offered the Holy Sacrifice countless times for twenty-four years." The immediate post-war years were sometimes difficult ones for Saint Mark's. But under the leadership of its ninth Rector, the Reverend William Dunphy, the Parish labored industriously to recover from the effects of war. Much maintenance, which had been necessarily deferred, was undertaken. The Parish House and the Rectory were renovated, as were the Locust Street doors. The Williamson Library was brought back from St. Michael's to form a parish library. In 1949, the Parish celebrated a “parochial centenary” with a series of special commemorative services. Not surprisingly, music, both choral and organ, played a large part in the celebrations. Music had long been a vital part of spiritual life at Saint Mark’s. Since 1867 its boy's choir had been a Philadelphia institution. And on Easter Day, 1937 the present organ, designed by the Aeolian-Skinner Organ Company of Boston and built by G. Donald Harrison, was dedicated. In the "organ world," it has been said, the Saint Mark's organ has come to be considered one of the best examples of tonal construction anywhere in the country and is undoubtedly the finest organ in the City of Philadelphia, church or otherwise. The Post-World War II years at Saint Mark's resembled those of many other older urban parishes. All over America, returning veterans and their families were moving en masse to newly built suburbs. As they left, the number of people listed on Parish rolls decreased dramatically. But during the period two very hard-working Rectors, the Reverend Emmett Paige and his successor, the Reverend Michael Becker, struggled to keep alive the traditions of Anglo-Catholic worship at Saint Mark's. During Father Paige's 30 years as rector, for example, many improvements took place in the church's physical plant. In addition, the present Holy Week rites were initiated - a step anticipating the inclusion of these ancient ceremonies in the revised 1979 Book of Common Prayer. Father Becker, who had served Father Paige as Curate, had been an invaluable help in instituting these changes. But it was during Father Becker's time as Rector of Saint Mark's that the liturgy was restored to its Patristic structure. This period in the history of the Parish was not without controversy, some approving of the changes, others less comfortable with the new liturgies. But Saint Mark's endured and survived this relatively mild winter of discontent. Father Becker also established the Food Cupboard, a program that was initiated in cooperation with Community Food Distribution Centers Program of the Roman Catholic Archdioceses of Philadelphia. This program continues today. The survival of American urban parishes has never been assured. At least two of the original Nineteenth Century churches formerly attended by members of Saint Mark's first vestry were either disbanded or merged with other congregations. But as Saint Mark's instituted its twelfth Rector, Father Charles Moore on January 6, 1982, the Feast of the Epiphany, there lay ahead a dozen busy years of Parish activity. In the first place, the nearly 150-year-old building needed major repairs. Parishioners learned the meaning of the phrase "efflorescence of stonework" when specialists were brought in to inspect leaks. Also during this time, Saint Mark's was placed on the National Register of Historic Places and joined with other Center City churches and a synagogue to form the Rittenhouse Coalition to preserve their historic structures. In a number of other ways, Saint Mark's moved quickly to create ministries that met new social and spiritual needs, especially the AIDS crisis. Saint Mark's also opened its facilities to a wide range of musical groups. Indeed, it is often called the best venue for concerts in the city. When Father Moore retired in 1995, one parishioner spoke openly of the "enrichment of his ministry as well as the ministry of each and all of his predecessors." These blessings, it was said, were part of the heritage of Saint Mark's. "During the years past," another parishioner wrote, "God has blessed us abundantly. Saint Mark's has stood for carrying out our Lord's will in worship as well as in faith and in life." On the Feast of the Presentation, 1997, Father Richard Alton was instituted as thirteenth Rector of the parish. Together with his wife, Barbara, Fr. Alton brought renewed attention to ministry with families and young adults, especially encouraging by example the practice of warm and generous hospitality. Fr. Alton was committed to the need in a catholic-minded parish for a careful and deliberate pattern of daily prayer, which he strengthened most obviously by his devotion to the schedule of daily masses, and by encouraging the establishment of a local ward of the Society of Mary. His unswerving commitment to the importance of the musical tradition of the church was embodied in several ways. First, he worked with parish leadership to identify resources for a re-invigorated choral program. Next, he led a campaign to refurbish and re-hang the change of bells in the tower, which had been unusable for several years. (A ninth bell to ring the hours and the Angelus was added to the tower at that time.) Then, he spearheaded the campaign to restore and enlarge the historic Aeolian-Skinner organ, including the addition of new divisions at the west end of the church, which have proved vital to the support of congregational singing. This time of revitalization for Center City Philadelphia saw a healthy increase in attendance and diversity, especially at the High Mass, which gained an increasing reputation as a fine opportunity to experience the grace and presence of God within the beauty of holiness. As a result, the Saturday Soup Bowl was established feeding more than a hundred homeless souls each week. Fr. Sean Mullen, who served as curate for four years under Fr. Alton was unanimously elected fourteenth Rector in November of 2006 and continues to build on the good work of previous years. Under his energetic leadership the parish community continues to grow; has undertaken several mission trips; established a Family Mass on Sundays together with a Boys and Girls Choir in the RSCM tradition; and adopted the former parish of Saint James the Less in order to establish what would become known as St. James School, a faith-based middle school in the Episcopal tradition, committed to educating traditionally under-resourced students in North Philadelphia. Mtr. Erika Takacs was called as Associate Rector in 2011, and Mother Nora Johnson began her priestly ministry here as Associate for Christian Formation after her ordination in January 2013.